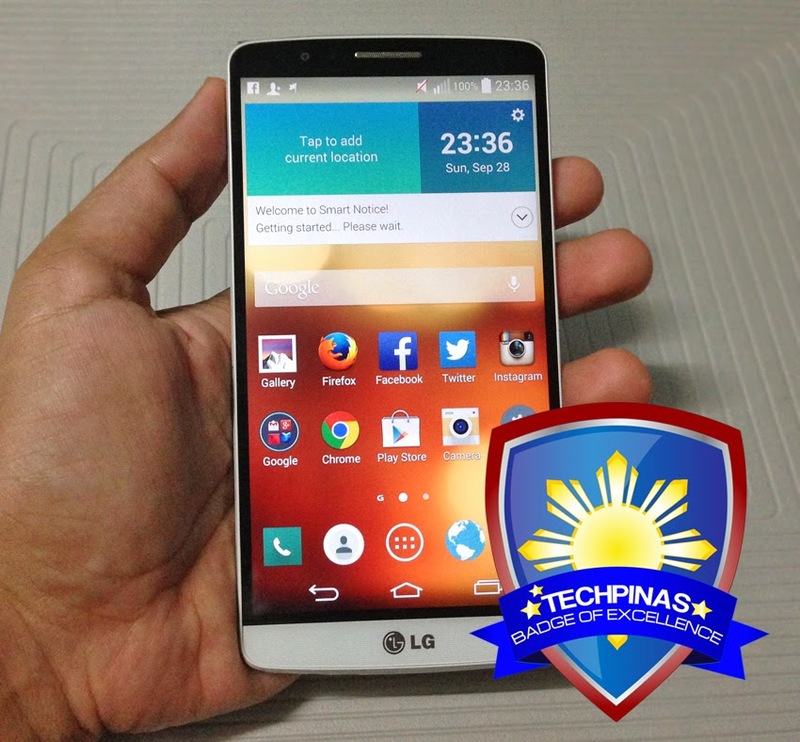 LG G2, the Korean company's very popular and best-selling 2013 flagship smartphone was a TechPinas Badge of Excellence Awardee -- and it also happens to be one of my absolute favorite daily handsets from last year. So needless to say, I'd been expecting a lot from its 2014 follow-up even before I actually got the chance to see the refresh in the flesh. I mean, the bar had been set really high. 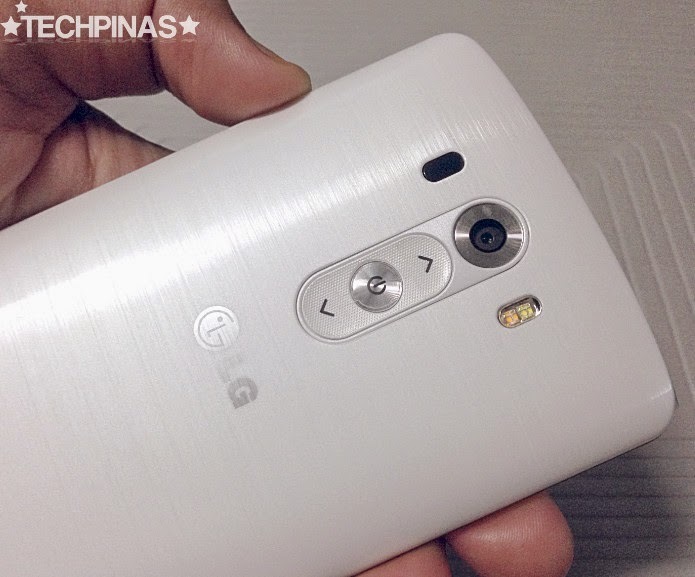 Early last month, I finally got the chance to own the LG G3 (I have it in Silk White as you can see in these photos) -- and after being with this smartphone for quite a while, I can confidently say that it has lived up to all of my earlier expectations (and has given me a whole lot more), enough to make me want to recommend it to anyone who's looking for a high-end Android handset that really delivers; One that could well be the leader of the pack. 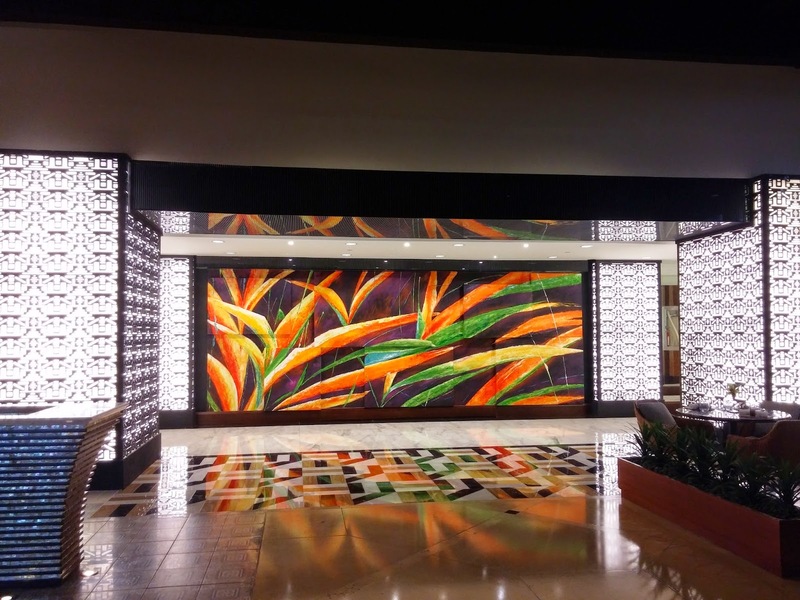 “The smartest innovation in a fast evolving smartphone market is creating harmony between advanced technology and a simplified user experience. 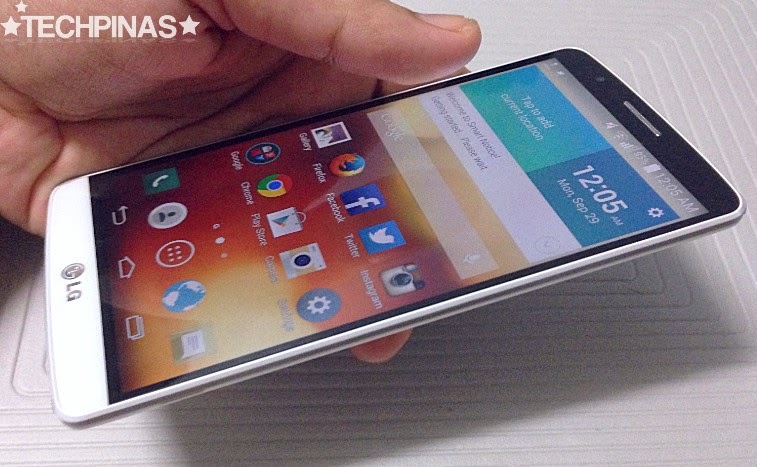 LG G3 is the result of our effort to actualise that idea into a tangible product. And we are extremely pleased with the result,” shared Dr. Jong-seok Park, President and CEO of the LG Electronics Mobile Communications Company. Developed under the Simple is the New Smart concept, the LG G3 is a culmination of consumer research based on LG’s product development philosophy, Learning from You. This new flagship smartphone was empowered with the best of what current technology has to offer, providing consumers with a user experience more ambitious than anything offered before by LG. 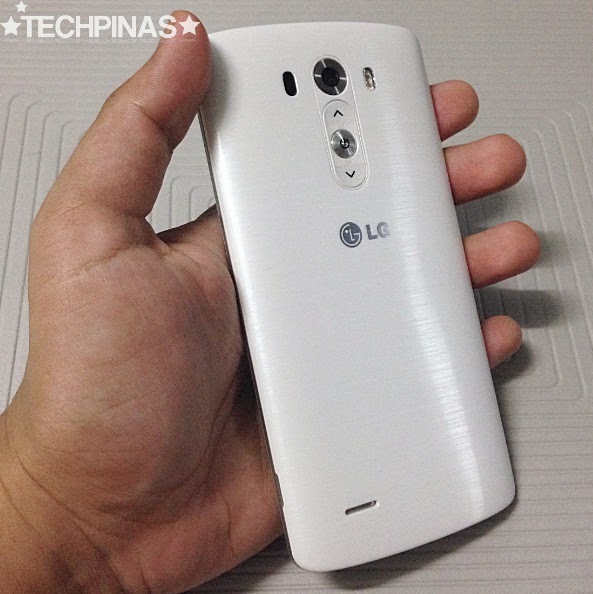 LG G3 has dimensions of 146.3 x 74.6 x 8.9 mm. Its massive 5.5 inch display pretty much dictated the footprint of the handset, which is obviously sizable -- though, I have to note that the company has gone to great lengths to keep the phone's size in check. In fact, to quote LG, "At 5.5-inches, LG G3 boasts a screen ratio of 76.4 percent with thin bezels all around so the phone feels as comfortable in the hand as a smaller traditional smartphone." Looks wise, the handset flaunts LG's new Floating Arc design language, which is highlighted by 'an ergonomic arch and a slim side profile' that supposedly provides a comfortable grip for everyday one-handed use. The removable plastic back cover with stylish metallic look and matte finish - available in Silk White, Shine Gold, and Black - doesn't only make the phone look more elegant but also provides additional friction between your hand and device, allowing for a firmer grasp on the phone. 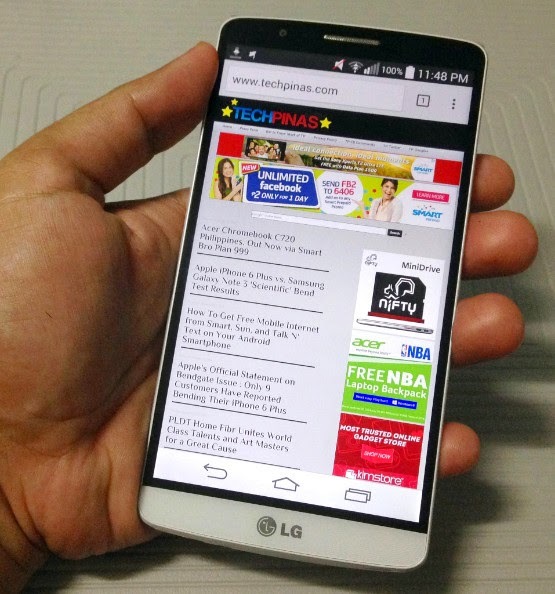 'Comfortable one-handed' use appears to be LG's overarching vision or goal in designing the LG G3 and, for the most part, I think the company has done enough to achieve that. I mean, despite the large footprint, I haven't had problems holding the phone with one hand while swiping on the display from left to right. However, to be frank, I find myself almost always having to use both of my hands when navigating the device's interface, especially when swiping down from the top panel to access notifications and connectivity options; The screen is just too big for me to do that with one hand. Should you get a protective case? 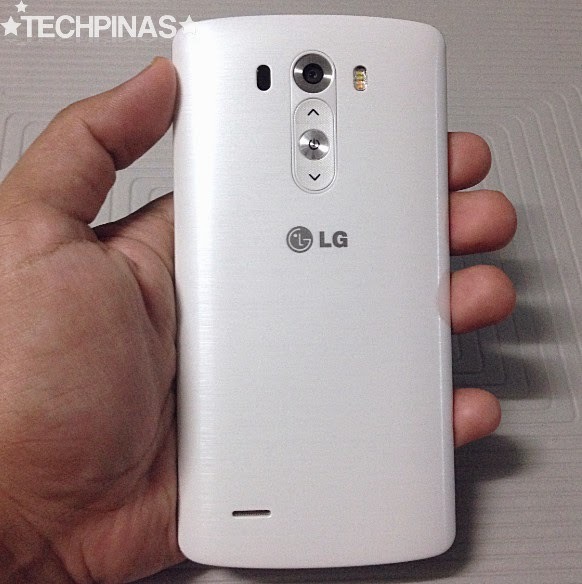 I know this sounds horrible but I've already dropped my LG G3 -- from a height of one meter, on a wooden floor. I was sitting in the cafe, playing with the handset when a friend surprised me from behind and - you already know what happened next. 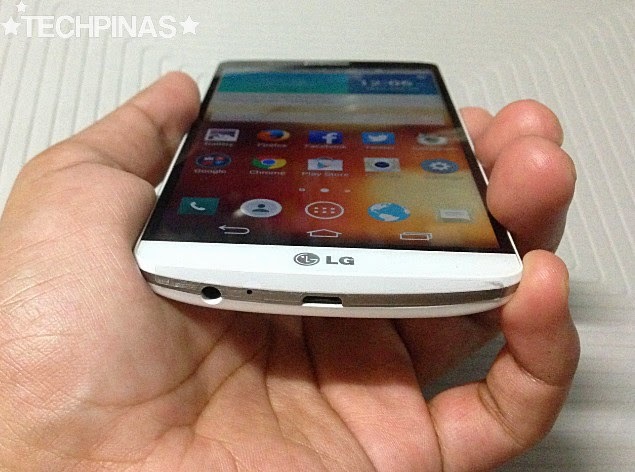 Thankfully, my LG G3 survived the ordeal with nary a scratch or a dent. Yup, it's very durable. 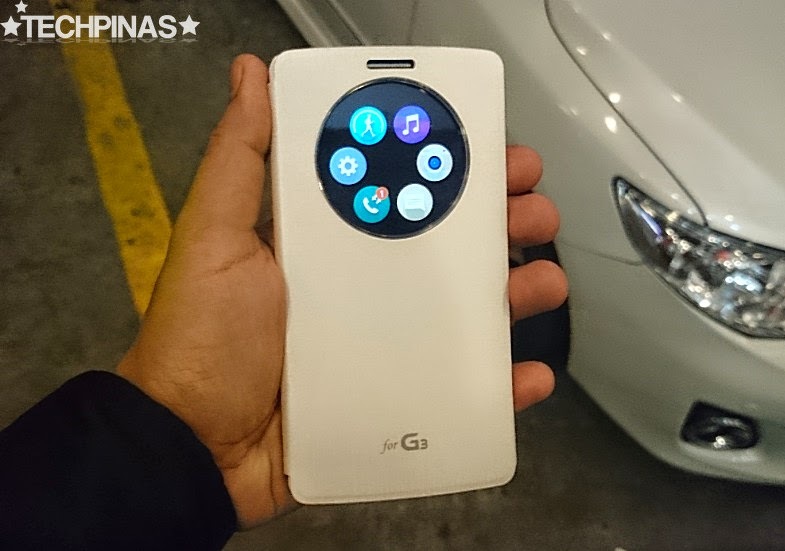 Nonetheless, I would advise that you get LG or Voia's QuickCircle case that doesn't only work as a protective case for both the screen and the back plate but also lets you access LG G3's unique QuickCircle interface. 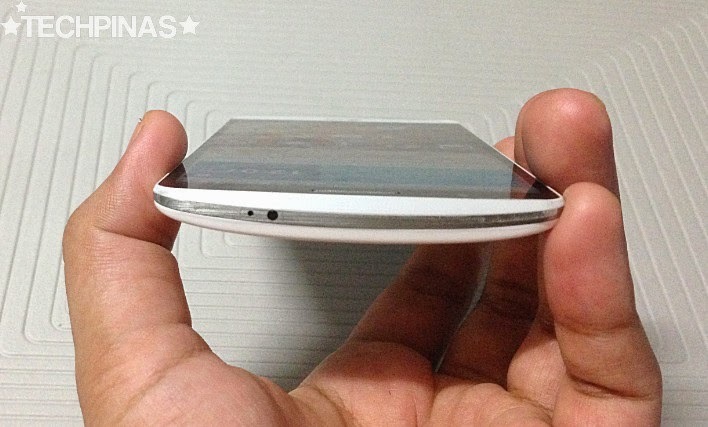 Some LG G3's design elements are totally fresh and highly unique - like the plastic back cover with brushed finish making it look like real metal and even this case with a large circular window that we really haven't seen before. 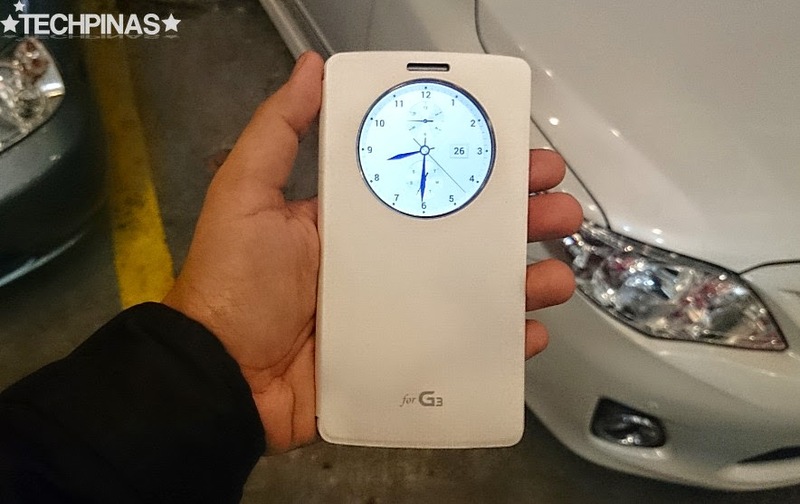 As a first and third generation Samsung Galaxy Note and Sony Xperia Z Ultra owner, I'm used to having daily smartphones with sizable screens so I wasn't about to be easily impressed by LG G3's display size alone. 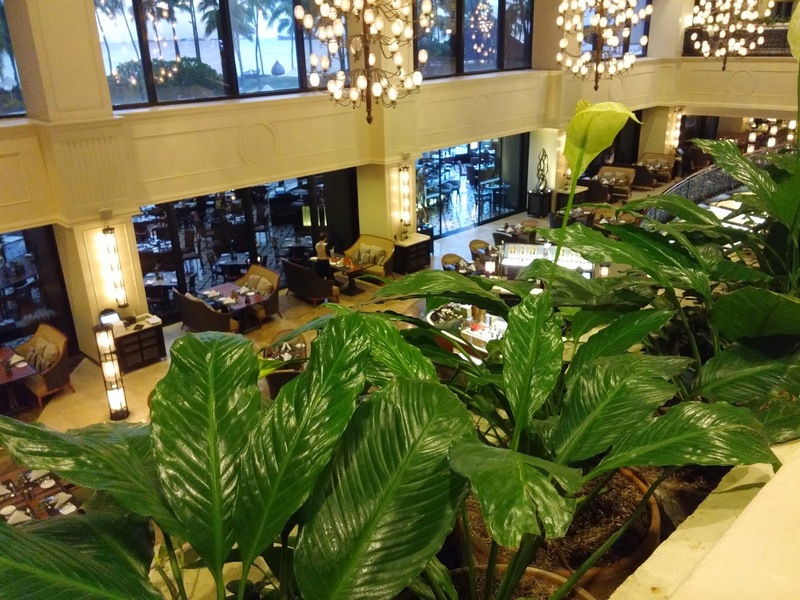 What I loved about this feature of the smartphone is its ultra-high Quad HD resolution which is responsible for its 534 ppi pixel density, resulting in the clearest and most refined details I've seen on a mobile device to date. Also, being an IPS panel, its color accuracy and brightness are top-notch. With 570 Nits of Brightness, you can clearly see everything that's on LG G3's screen even if you view it outdoors, under direct sunlight. There are two things that are particularly special about LG G3's 13 MegaPixel main camera at the back located on top of the RearKey. 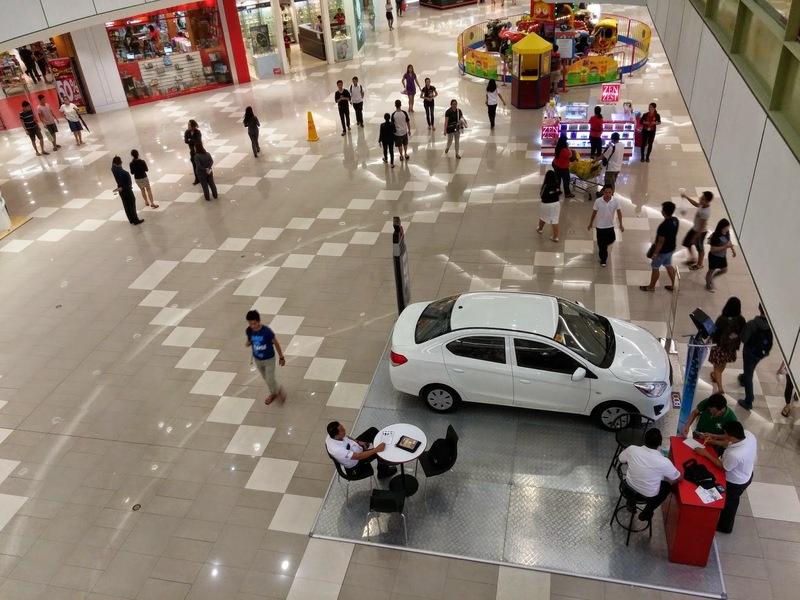 First, is its Laser Autofocus System. 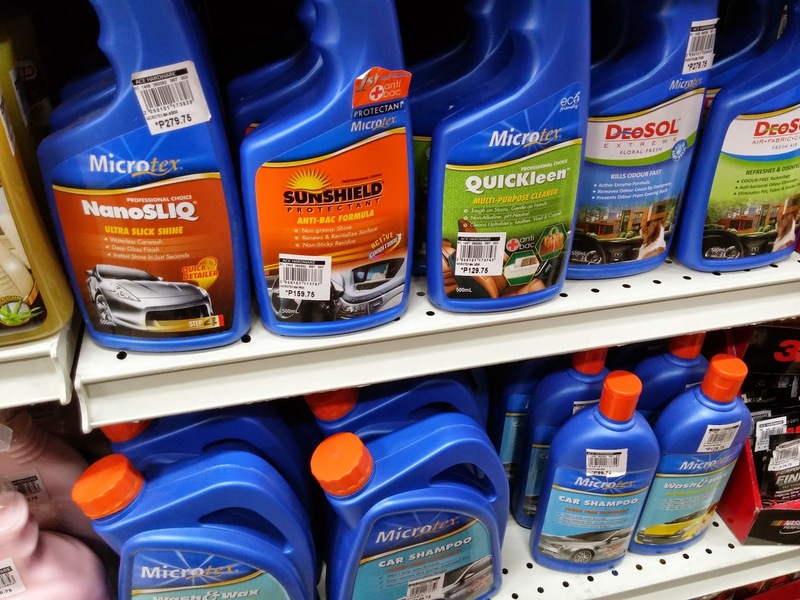 And second, an improved version of Optical Image Stabilization or OIS+. The LaserAF module emits multiple pulses of low-intensity eye-safe infrared light through what's called 'collimating' optics and the elliptical infrared sensor left of the camera gathers the rays when they get refracted. The imaging system uses data from the 'return' of these rays to determine the exact distance of the subject from the lens and helps choose and lock the respective focus depth. All of these happen within just a fraction of a second - 0.276 seconds autofocus time to be exact, which I think is very impressive. 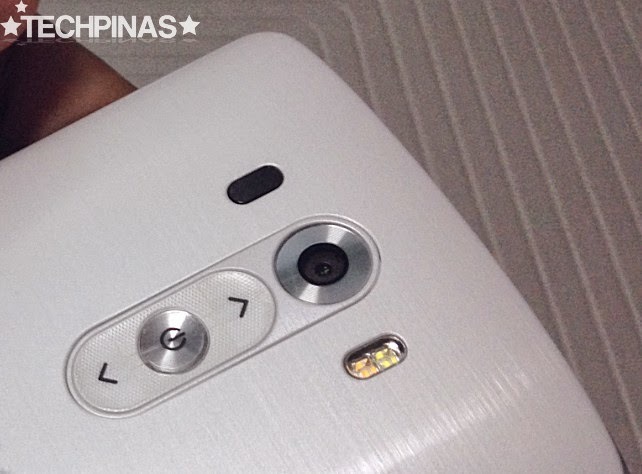 LG G2 is one of the first smartphones - that's not made by Nokia - to have a camera with Optical Image Stabilization. The main element of which is a floating lens that moves to compensate for hand movement or shaking while taking a photo, resulting in crisp images. LG G3 also has that same imaging technology but it's on higher level; OIS+ features Hybrid Image Stabilization that now also compensates for angular or what's called 'shift camera shaking' by utilizing the handset's accelerometer and velocity sensor. What I love about these shots isn't just their clarity or vibrance but how accurate their colors are -- especially the whites. 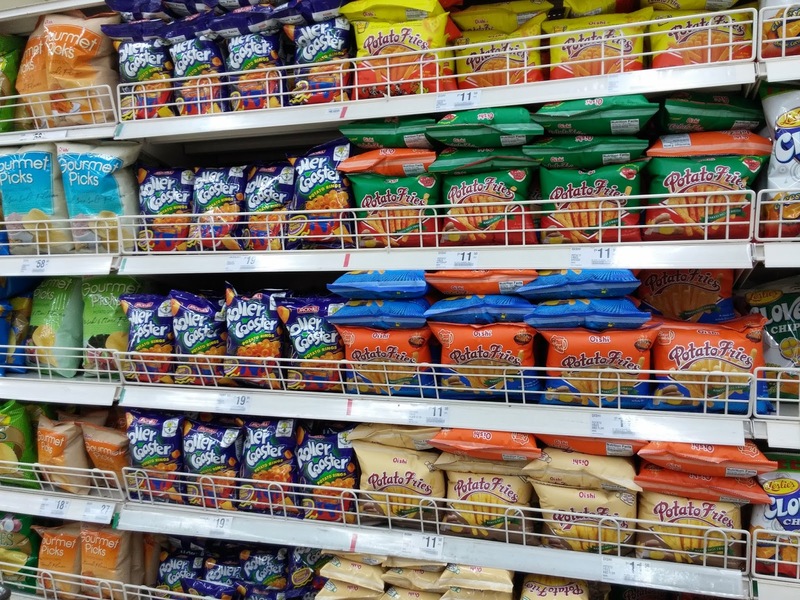 Definitely no yellowish, reddish, or purplish tint distorting the image quality. 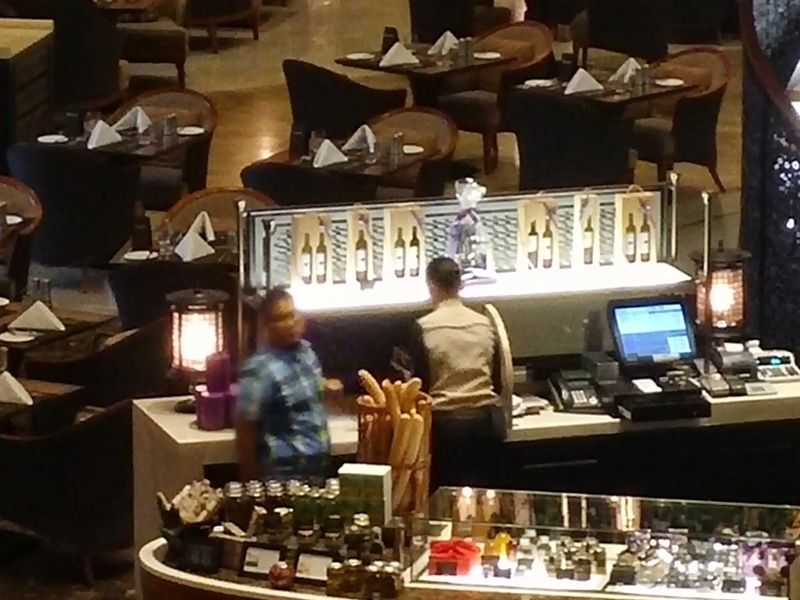 Off hand, I'm thoroughly impressed with LG G3's camera. 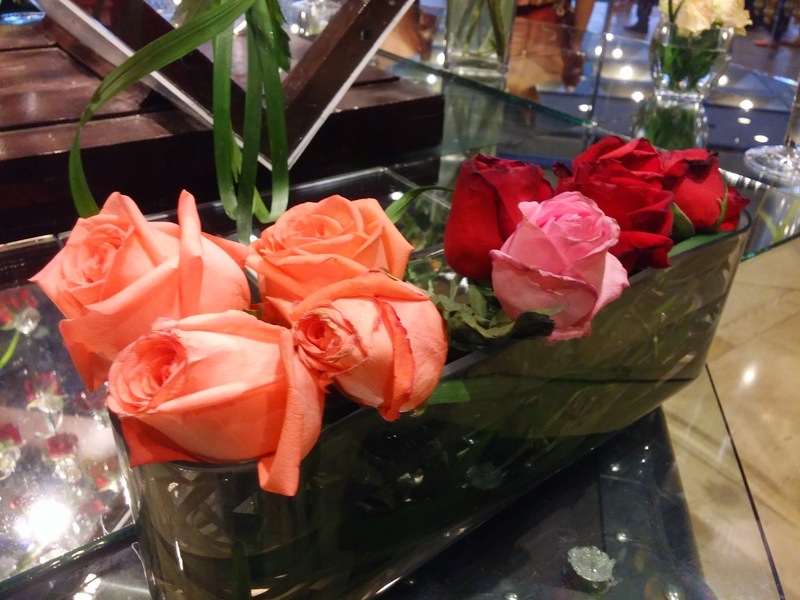 If you ask me, I think this smartphone is good enough to be a point and shoot digicam substitute. I mean, these photos speak for themselves. As I've explained earlier on TechPinas, the innovative RearKey enables the user - regardless of whether he or she is left or right handed - to switch the power on and off, activate the QuickMemo, adjust the volume and use the camera of an LG handset more conveniently. Based on a consumer behavior study conducted by LG’s Research and Development group, the Rear Key gives users more control and easier access since this is where their index fingers are naturally located. This also results in fewer dropped phones when adjusting the volume while on a call. The functionality of LG G3's RearKey are exactly the same as that of LG G2, LG G Pro 2, and the LG G2 Mini but the buttons have been redesigned - that is, the volume buttons are now concave and the power button has been made circular with concentric pattern - to make them easier to press. I've heard some people describe LG's RearKey as 'weird' and 'oddly placed'. I doubt they've even tried using an LG smartphone donning one. 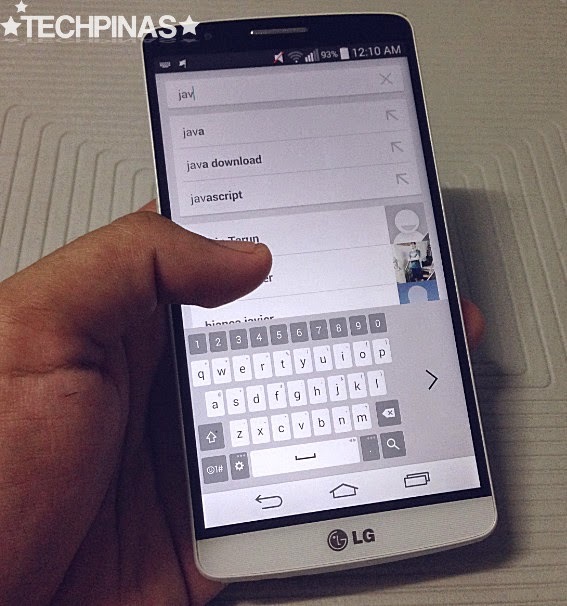 I personally find the RearKey very useful -- especially when adjusting the volume of my LG G3 during calls. For me, it's 'genius'. 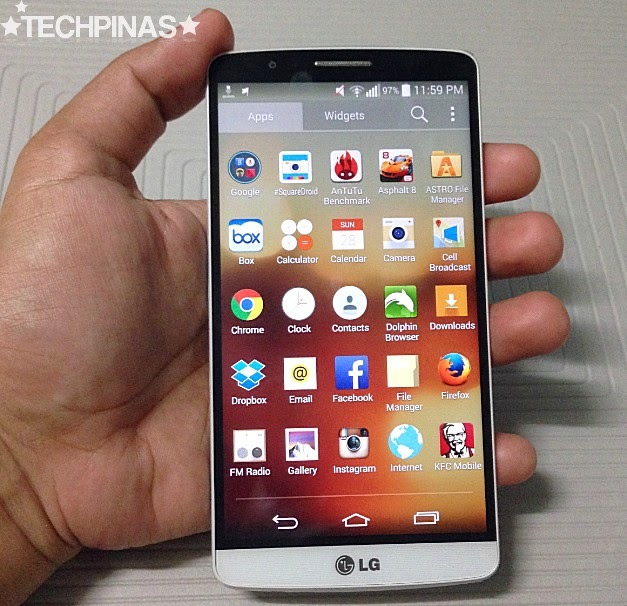 There are two LG G3 variants available in the Philippines. One has 2 GB of RAM and 16 GB of ROM while the other has 3 GB of RAM and 32 of ROM. Both models have a microSD card slot for expanding storage and are powered by a 2.5 GHz Qualcomm MSM8975AC Snapdragon 801 chipset incorporating four Krait 400 CPUs and an Adreno 330 graphics processing chip. What I have here is the 16 GB model. 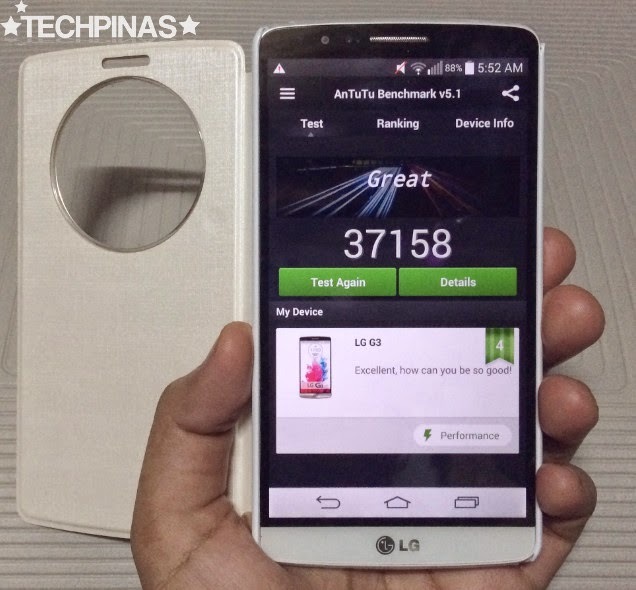 The combination of the above-mentioned innards gave LG G3 a score of 37,158 when I ran Antutu Benchmark Test on the device last night. This mark is pretty standard for smartphones running on such set of internal specifications -- although I believe it would have been far higher if not for the 5.5-inch Quad HD display, which is obviously quite a resource hog and really takes a lot from the handset's performance. In fact, if ever one would - at times - detect a bit of lag when navigating the interface, I believe this monster feature could well be the culprit behind it. 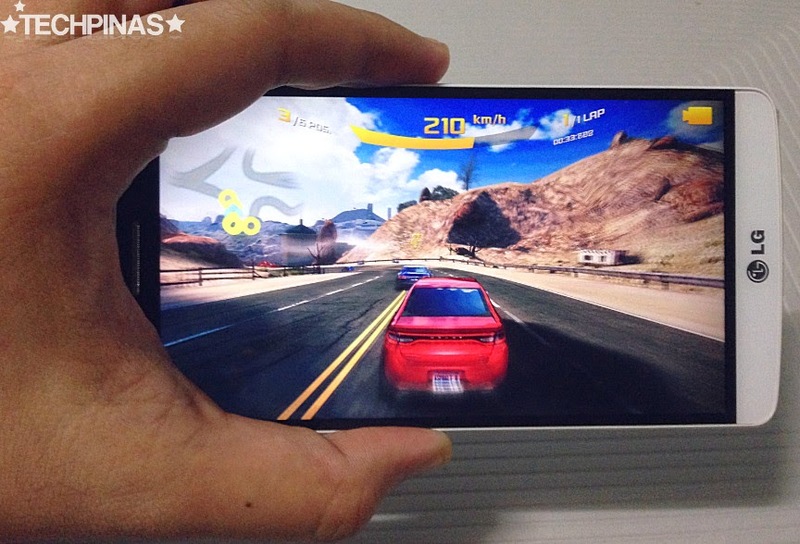 Nevertheless, thanks to its powerful processor and graphics chip, gaming experience on the LG G3 is top-notch. Asphalt 8 and Injustice: Gods Among Us are two of my favorite titles currently and both specs-intensive 3D games run on this smartphone flawlessly. LG G3 is the first smartphone by the Korean Giant to feature the all new UX interface and experience for the Android operating system. This UI will eventually be implemented on all of LG's upcoming handset releases, including entry-level to lower midrange ones like LG G Fino. “With the basic principles of the LG G3’s UX features rooted in making complex technologies simple and convenient, our goal was to provide consumers with a user experience they genuinely need and want. Standardizing these features across our entry- and mid-tier mobile products is just a natural extension of our desire to make every LG device feel premium and unique," shared Dr. Jong-seok Park, President and CEO of LG Electronics Mobile Communications Company. True to the company's 'Simple is the New Smart' concept, LG adopted this minimalistic user interface design replete with flat graphics. "The circular motif of the graphic assets in the new UI was derived from the shape and concept of LG’s logo, reflecting its unique visual style and identity." Off hand, my favorite feature of the UX Interface would have to be the multitasking panel which shows thumbnails of active applications and games in grid view. It practically shows you everything that's happening on your phone with just one glance. 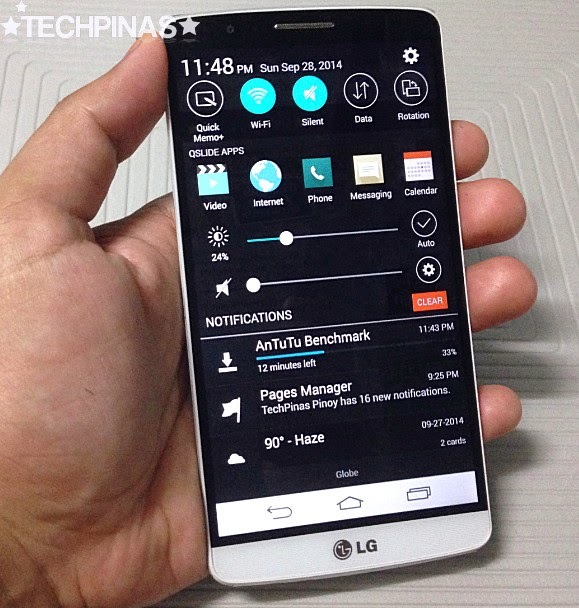 I personally find LG UX very visually appealing. I like neat and cute interfaces so I'm naturally drawn it. Some might say that it looks too simple - like it's just practically the vanilla Android UI with customized icons - but for me, additional features like QuickMemo, QSlide Apps, and Quick Remote that are all easily accessible via the drop down notifications tab would tell you that LG really tried to give users a unique experience via this skin. Knock Code lets users to unlock their device with a pattern of taps. 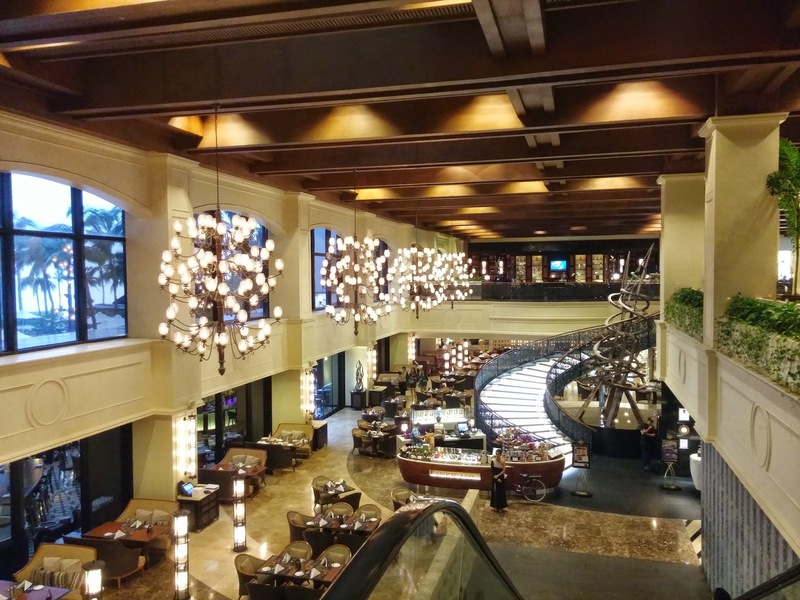 A marriage of security and convenience, this unique feature allows users to create a personalized code that can be entered anywhere on the inactive screen. 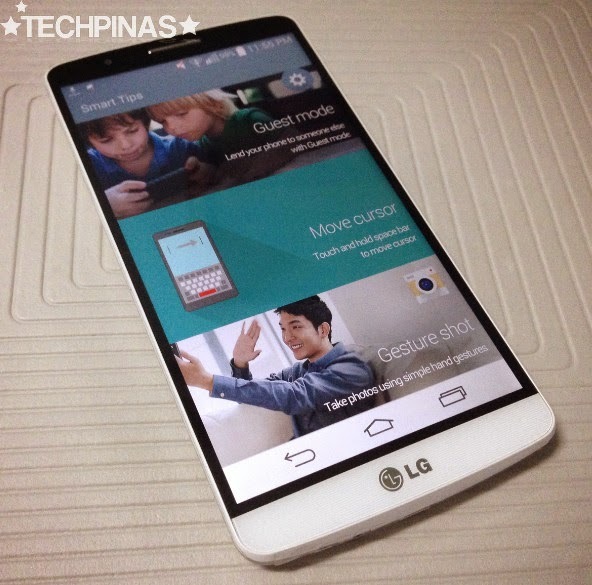 With the LG G3, users also have the option of being able to use KnockON (plain double tap) to wake the screen to check the time as well as enter the home screen directly via the more advanced Knock Code. 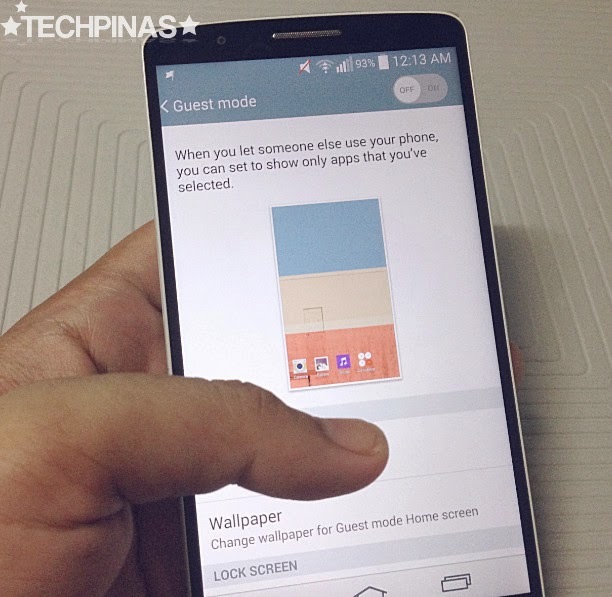 LG G3 has a feature called Guest Mode, which eliminates the fear and hesitation that you might feel when someone borrows your phone. I know, it's not that you have something to hide -- but smartphones have become very personal and private to a lot of users so it's but natural for us to protect certain content and applications in our handsets from prying eyes. 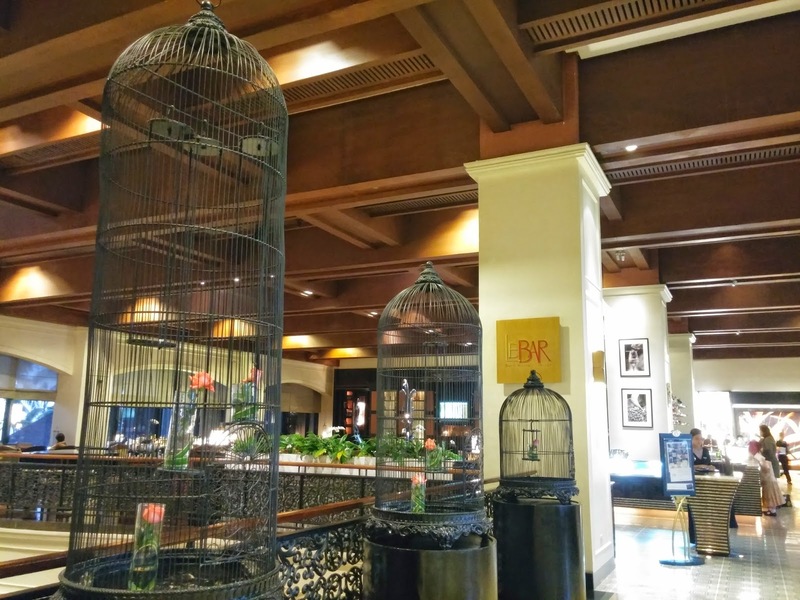 To activate Guest Mode, simply go to your phone's Settings, scroll down to Personal, and click on Guest Mode. Then, simply select "Allowed App" option. After doing this, you will be presented with a list of all installed apps on your device. Just go through them and select the apps you want others to be able to see and use under Guest Mode; removing the check on boxes for apps you want to be hidden. 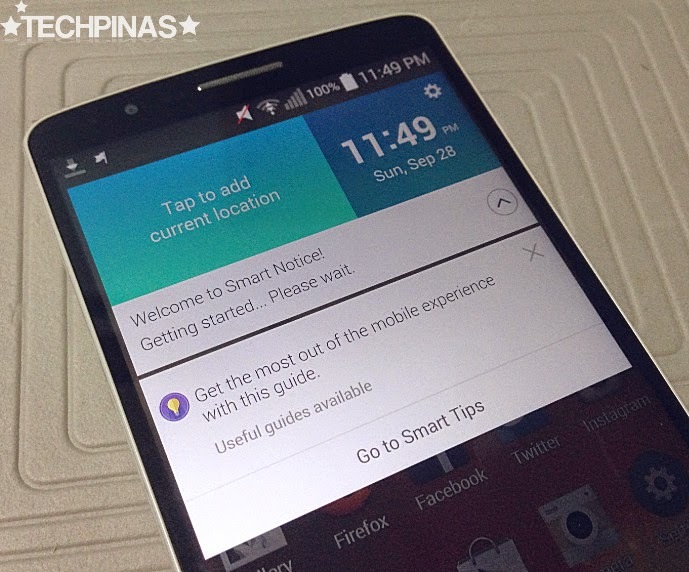 After making your selection, slide the switch on top of the screen to turn on Guest Mode. 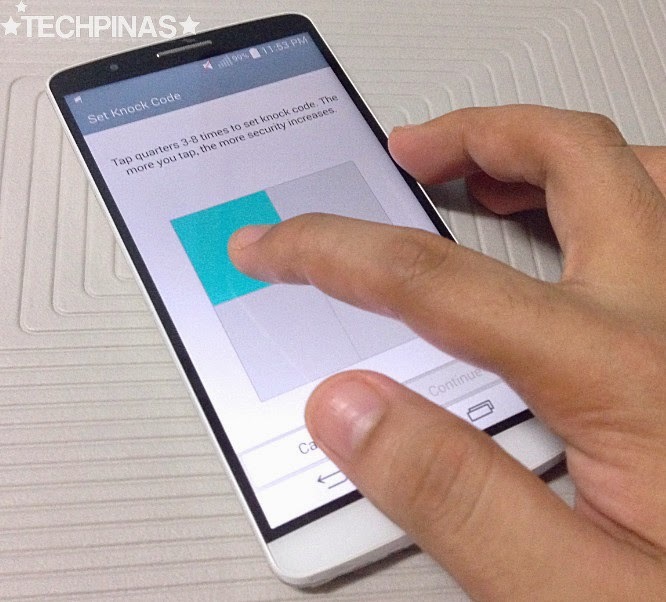 Your LG G3 will then walk you through creating two different passcodes for unlocking your device's screen. 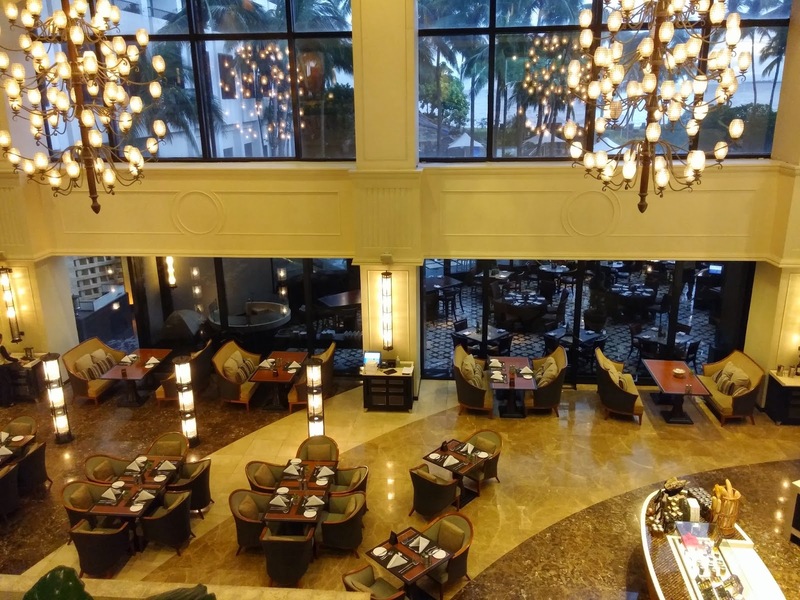 The first passcode will be for unlocking your device directly into Guest Mode and the second will be your primary passcode for regular use with access to all applications. 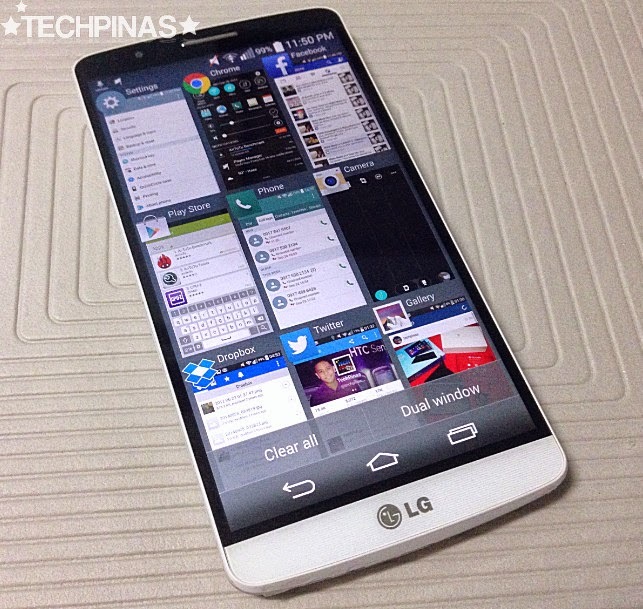 You can certainly accomplish more tasks on the LG G3 by multitasking on the device. Dual Window mode, which you can launch from the multitasking panel, lets you run two apps at once -- one on top of the other. Right now, though, LG only has a handful of preset applications that support this - including Chrome, Google Maps, Youtube, Gallery, Mail, and Messaging - but I'm hoping that they'd open it up eventually so more third-apps could access it. The Smart Keyboard is powered by an adaptive technology that learns as you type for faster input along with less typos. Smart Keyboard reduces input errors by up to a whopping 75 percent by tracking and analyzing typing tendencies and intuitively predicts what word the user intends to type. The height of the Smart Keyboard can also be adjusted to better fit your hands and how you usually place your thumbs on the display. Individual keys can likewise be customized with frequently used symbols for even more speedy input. And here's the cool part: Simply swipe your finger across the keyboard - either to the left or to the right - to get a smaller version that's ideal for one-handed use. So intuitive! 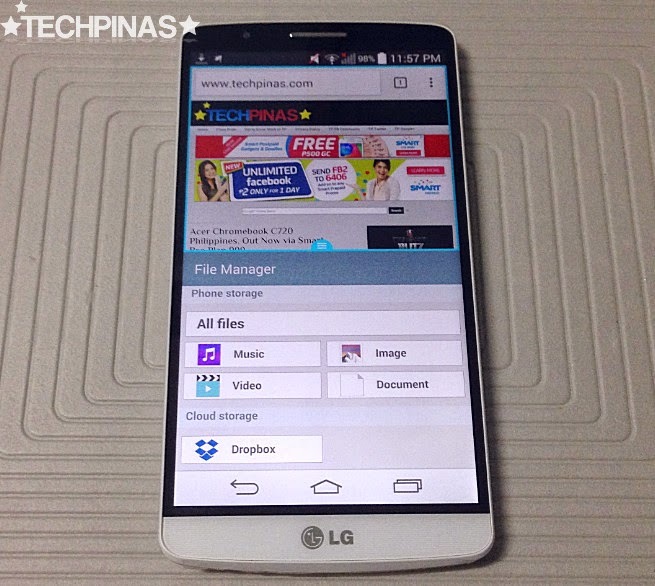 LG G3 has a larger and higher resolution display than its predecessor so it was but natural for us to expect that the company would give the 2014 release a bigger battery. The thing is, that just didn't pan out. 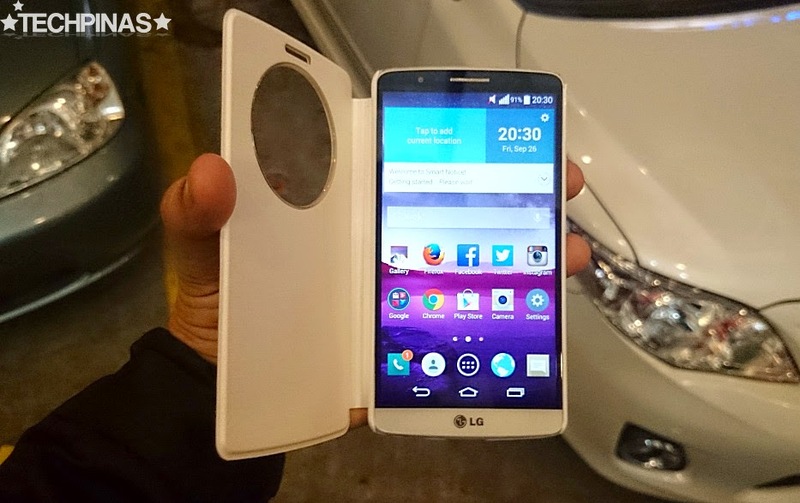 Instread, LG G3's pack ended up being smaller than that of LG G2 by 200 mAh. 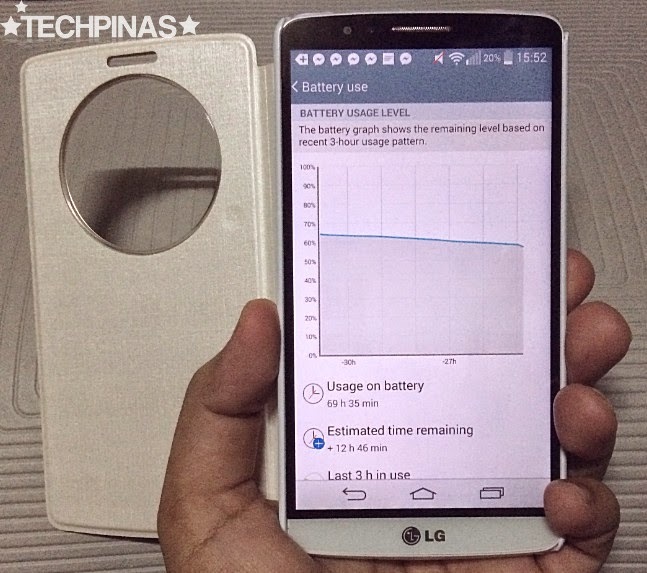 LG G3's battery life, I would say, is just average. You can't call it an 'energizer bunny' but it's not horrible either. I usally get around 23 hours of uptime from the device with mixed usage, which include updating my social networking accounts, uploading photos, watching a few videos on Youtubes, browsing websites via Chrome or Firefox, taking several photos, playing a couple 3D games for a few minutes, and listening to some music tracks. On some occassions, though (as shown in the photo above), the battery gives me almost three days of uptime; That usually happens when I set the screen brightness to only around 5%, turn off LTE, and limit the use of specs-intensive games and applications. 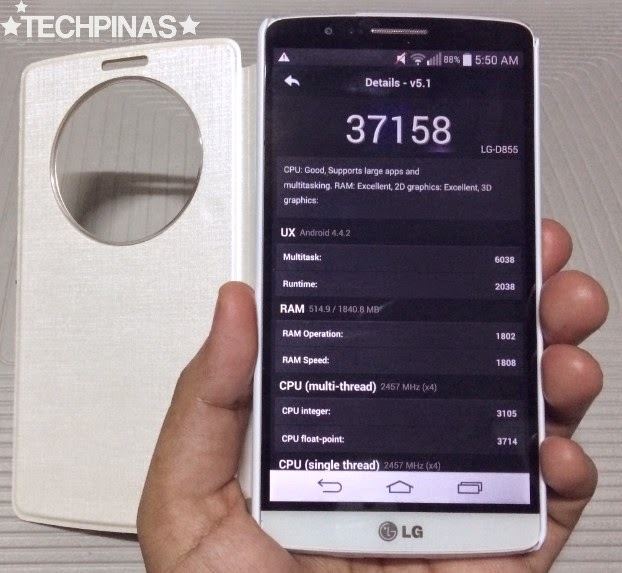 LG G3 has one of the loudest - if not the loudest - loud speaker I've heard on a smartphone. 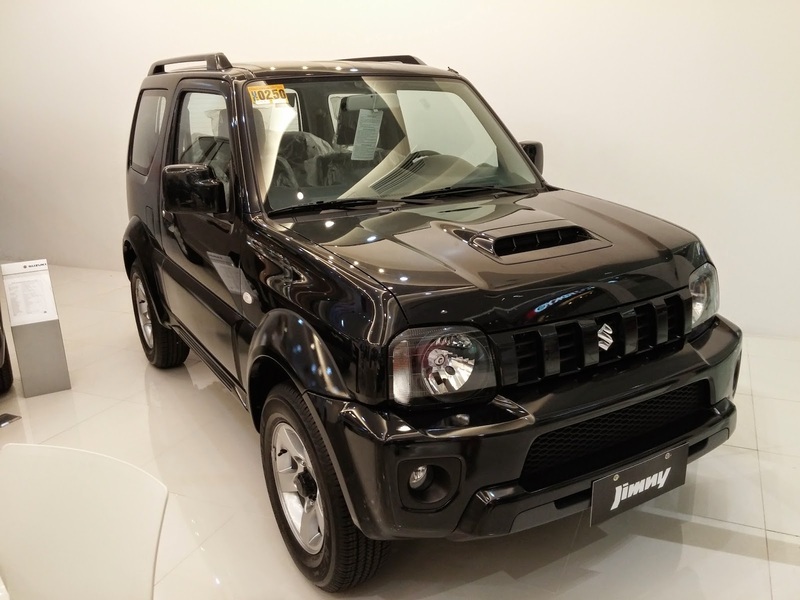 It's said to produce 85 decibels of sound, which is obviously louder than Samsung Galaxy S5's 73-dB rating as well as the 80 dB average among handsets in its price category. 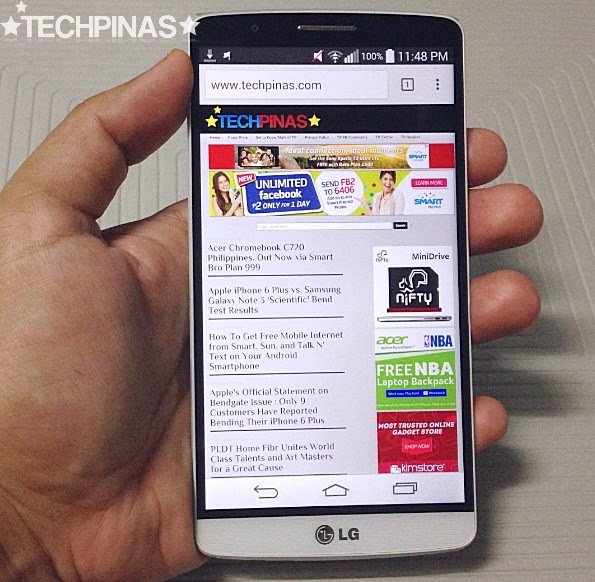 And what's even better is that the sound emanating from LG G3 isn't just loud but also clear and bright. One downside, though, is that the speaker is found at the back of the handset so when you put the phone on a solid surface - screen up - it gets blocked and the sound doesn't come out as freely. Another key innovation that sets the LG G3 apart from its main rivals is the beautiful and intuitive QuickCircle Interface, which you can access by using a supported window case for the smartphone. 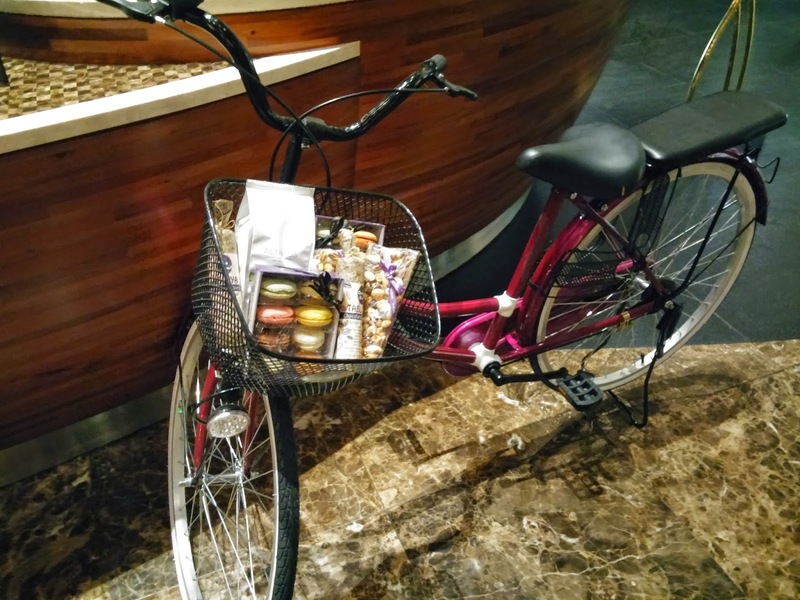 I'm using the one made by VOIA and I highly recommend it. There's nothing complicated about this UI. It turns on as soon as you close the cover or when it completely covers the phone's display. By default, it shows a virtual watch that fits perfectly inside the circular window. Swiping on the watch reveals other applications like LG Health (which counts your steps and calories burned), touch to capture Camera (that delivers 16 MegaPixel shots but doesn't allow you to turn on the flash when needed), as well as the music app. 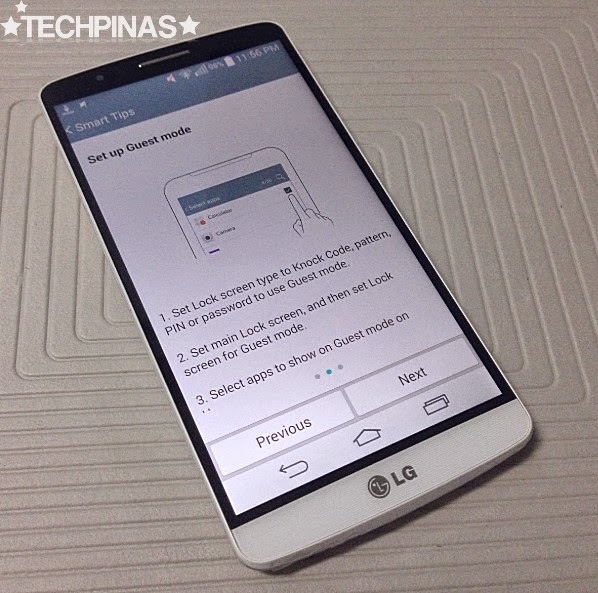 If you're using your LG G3 for the first time, you can activate this interface by going to you phone's System Settings, clicking on QuickCircle Case, and turning on the switch. Here, you can also select the apps that you want to appear on the circular screen. You may also download applications that support the QuickCircle Case via Google Play Store; My favorite one is Quick Circle Apps by Sternberg Labs, which already includes a Calendar, Calculator, Compass, Dialer, and Torch, among others. With the release and success of LG G2 last year, it became clear to me that the Korean company has already figured out how to do a flagship Android smartphone right; One that can give its main competitors a serious run for the money. LG accomplishes that by making sure that their top-of-the-line device comes not just with a gorgeous, head-turning design but also with an intuitive and unique user-experience; Not just with the best hardware that they could have given it at that point but also with a compelling set of software innovations. LG G3 is the very culmination of everything that the Korean company has learned so far in crafting a high-end Android device. 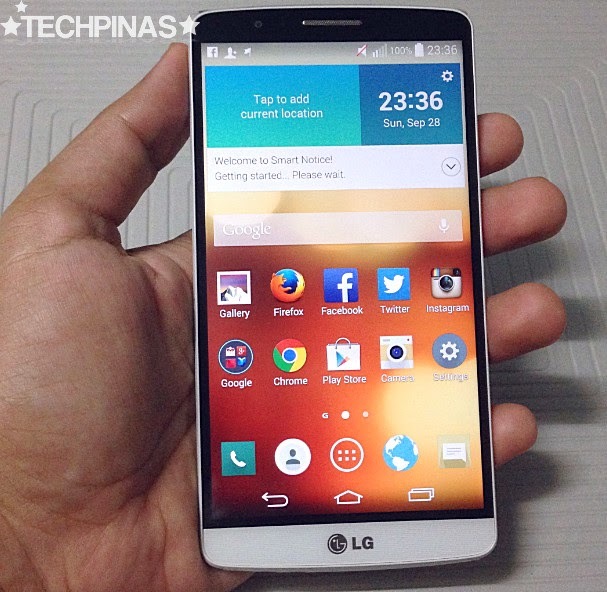 And as an LG G3 owner, I can really say that it's highly laudable effort. I understand that there are already a number of tech websites that call this release 'the best Android smartphone in the world today' and I totally get why they give LG G3 that title. Personally, considering all the top-notch features that this handset gives you - including its large, clear, and brilliant 5.5-inch Quad HD IPS display, the 13 MegaPixel camera with LaserAF and OIS, 4K video recorder, the stellar set of internal specs, and all the industry-leading innovations that I mentioned in this review - for an amount that's less than what LG's rivals charge in this price category, I'm delighted and proud to give the LG G3 the 2014 TechPinas Badge of Excellence.